Why Are There Streaks on my Window? You imagine your ideal Portland area home with sparkling clean windows. However, despite how well you think you’ve cleaned your windows, you still end up with streaked with unsightly spots. These window streaks are caused by washing your windows with hard water. 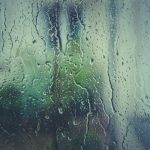 Hard water in Portland can cause damage to your windows, especially if they are tinted. Many people think that water is just water. However, there are actually two basic kinds of water, hard water and soft water. The words “hard” and “soft” when applied to water have nothing to do with the way the water feels. Whether the water is hard or soft is dependent upon the mineral content of the water. Hard water is the most common type of household water. As rain falls, the water seeps into the ground and makes its way into an underground aquifer. The water from the aquifer eventually emerges as part of a well or spring. On its journey through the ground, the water picks up minerals from rocks, typically calcium, lime, magnesium, and sulfur. After these minerals reach a concentration of at least one grain per gallon (gpg), the water is classified as hard. Cleaning your windows with hard water will result in window streaks. Soft water has very little mineral content, less than 1 gpg. Soft water does not come from underground and therefore has not come into contact with minerals. Soft water is rather surface water found in rivers and lakes, or collected as rainwater. Hard water in Portland is not a major problem if you live in the greater Portland area as your tap water likely comes from the Bull Run Watershed where the water is typically ¼ to ½ gpg. However, if you live in an area outside of the city, you may have more of a hard water Portland problem if your tap water comes from a different source. Even if your water is soft, reduce the chance of window streaks and damage to your tinted windows by cleaning them with demineralized bottled water. Avoid using hard water which will leave mineral deposits in the form of window streaks on your tinted windows. Also, do not use popular cleaning products, especially those containing ammonia. Tinted windows should be cleaned with a soft cloth and demineralized water. You may add a small amount of baby shampoo. There are cloths on the market specially designed for use on tinted windows. With the right cleaning products and techniques, your home will remain bright and free from window streaks. Tinted windows add comfort and value to your home. They cut down on glare and energy costs, protect your furniture from the sun, and come in a variety of color tints to enhance your décor. Pacific Window Tinting is the premier Portland window tinting expert for both residential and commercial properties. Contact us today to learn how tinted windows can improve your home or office. Film, however, isn’t just for glass. It is much more than just tinting for windows. We can install film on the walls of your offices, hallways, lobbies, or the windows and glass if you’re a traditionalist, basically just about anywhere. 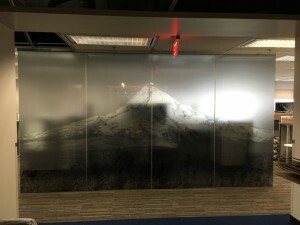 Decorative film includes anything from a logo and text to large-scale murals. Why not apply a cool film, eye catching design, or brand graphic to take your Portland work environment up a notch and impress your customers and clients! Stained glass windows have been around since the first century. Their gorgeous designs were used to beautify buildings, manage light, and share cultural and religious stories. Churches and monasteries used stained glass windows to inspire the faithful through visual narratives. 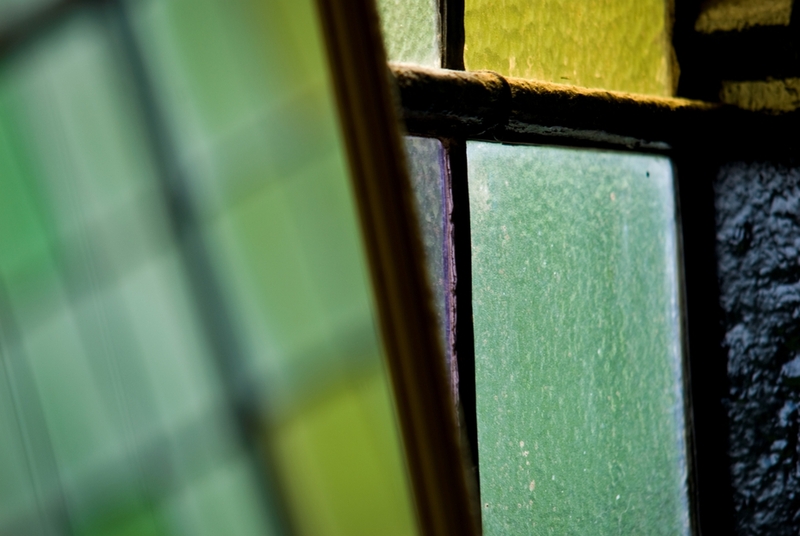 We like stained glass windows because their beauty changes as the light moves across them throughout the day. The bright colors and changing patterns of stained glass windows stand out against their backdrop and draw our attention and admiration. Stained glass window tint have become more popular for homes, as people look for ways to add charm, detail and self-expression to their residence. Although we’d all like to incorporate stained glass windows into our home décor, the cost of premade stained panels can be daunting. Pre-made stained-glass panels starting cost is $150 per panel and could go as high as $10,000 for larger windows and more detailed designs. Artisans may charge you a minimum of $1,000 for a custom panel. While stained glass windows can cost thousands of dollars for materials and installation, stained glass window tint film offers more advantages at cost-effective rates. Stained glass window tint is a decorative, translucent film and provides an affordable, quality alternative that creates a visual effect similar to a stained-glass window. Your stained glass tint in the window will make a statement and so should be placed in areas where it will be best viewed and appreciated. Place stained glass window tint on any number of windows in or around your entry door, on a window in a hallway or staircase landing, or for lovely privacy in a bathroom window. If you have several windows in your living room or in a hallway, think about adding stained glass window tint to offer color and decoration while delivering the full light available during the day. Indoor porches, sunrooms, or areas with skylights are also great spots for stained glass window tint film, with maximum light to enjoy the beauty of the colors. You can select from a our wide selection of available colors or designs. Or, you can work with the team at Pacific Window Tinting to create a custom design, completely unique and personalized to fit your space. Your custom stained-glass window tint is limited only by your imagination. You’ll get the functional benefits of heat and glare relief, saving energy and money while beautifying your windows. Brighten your home (and your spirits) by adding stained glass window tint to your windows. Contact Pacific Window Tinting to learn more about design options. Many architects are learning that tinted windows are one of the best things that could have happened to the world of architecture. In the past, architects had to make a choice between putting windows in places where they look attractive and letting in natural light, or making sure that the sun does not make the building uncomfortably hot. However, with better window tinting available for commercial and residential buildings, that is no longer an issue. Architects can now focus on placing windows where they look best and where they will let in the most natural light rather than worrying about placing windows in locations that will not bring in too much heat. In the past, an architect needed to consider where to put windows based on where the sun would be less likely to overheat the house. For instance, on the West coast, such as in Oregon, Washington, and California, windows on certain sides of the house will receive sun at different times of the day. Windows on the east side of the house will receive sunlight at a low angle in the morning. On the west side of the house, windows can cause cooling problems as the sun will hit those windows as it is setting. Large windows on the south side of the house can also cause cooling issues as they will receive the blazing mid-day sun. Those windows placed on the north side of the house will not often receive a lot of direct sunlight. That is three sides of the house were windows must be placed carefully if the architect does not want to build a house that is uncomfortable in which to live or expensive to cool. Another option that was available to architects before window tinting was window overhangs. Window overhangs can be both decorative and practical, keeping the sun out of windows that are on sides of the house that get the most sun. Other options include changing the window shape to make sure that the sun does not overheat the house, or providing overhead clearance over the window. While these features can add design to the house, they do not always work with the style of the house. Additionally, sometimes such designs can keep natural light from getting into the house as well as keep it from overheating. Clearly these options were helpful to keeping buildings cool but they did not offer a perfect solution to the problem. Double-paned windows are another design that architects can add to buildings to help keep them from overheating or losing too much heat. Double-paned windows do keep the outside air from getting in through the windows. However, what they do not do is keep the sunlight from blazing through. Many people think that they cannot tint double-paned windows. This used to be true because the tinting would cause the heat to get trapped between the windows and they would break. However, modern technology has found ways for double-paned windows to be tinted without breaking them. Therefore, having a professional service tint the windows is important to making sure that they do not break. Tinting windows of any kind is important for architects because with window tinting, architects do not need to stress placing the windows based on the sun’s location. Windows that face the west side of the house can be tinted. This allows the design of the house to not be compromised, and the architect to build a building that will allow a lot of natural light to be used. Buildings that allow natural light to come in through the are more pleasant, cheaper to light, and natural light is better for eyesight than florescent lights. In addition to window tinting allowing architects to stay true to their designs by giving them freedom of window placement, window tinting can also add beauty to a building. The window tinting can be used on commercial buildings to place advertising, or on residential buildings to add colors or designs to the glass. Tinting is also far less expensive than purchasing decorative glass. Regardless, if an architect wants to design a building surrounded with windows, put windows in places that let in natural light, or add some decoration to their designs on the windows, window tinting is one of the best techniques available. No longer are architects limited to where they can place windows. Building design can now focus on aesthetics, as well as bringing a little sunshine inside. Also, even windows that are double-paned can take advantage of the benefits of window tinting. 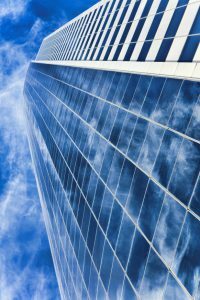 As more architects realize the freedoms that they have available to them because of window tinting, more interesting building design will be possible without sacrificing the practicality of natural light. If your upcoming project would benefit from window tinting, call our team today. We are happy to answer any questions you may have. Windows are often what customers first see when they look at your establishment. Big, bright windows create an open and welcoming image. But those same windows can create problems. Glare, heat, UV damage and vulnerability to thieves and vandals are some of the downsides of large windows. Commercial window tinting can help. Window film helps you save money by reducing hot spots and glare. It can also slow burglars and thwart vandals. Businesses often consider installing window tinting to help save energy. Window film reduces the heat that enters through windows keeping your interior cooler, reducing the need for air conditioning. You’ll save on energy costs while reducing wear on your HVAC system. Employees will feel better when hot spots from southern-facing windows are eliminated. Savings can be substantial and we can help you calculate the potential financial gains. Learn more by requesting an energy assessment. How Much UV Protection Do You Need? Even in cloudy Portland, the sun’s rays can fade your furnishings. Sunlight damages floors, furniture, merchandise and equipment. Window film helps preserve the value of your property. More importantly, film can help protects people’s’ health. You don’t need to be sunbathing to experience the damaging effects of too much sun. Window film is available in various strengths of UV protection. Learn more about window film’s power to protect against the sun. Does Your Business Require Privacy? If your office windows are at street level, your business may be visible to passersby. Privacy will be nil, and if your staff uses computers, glare can be a problem. Window film is available in various levels of reflectivity. Reflective film allows you to see out, but keeps those on the street from seeing in. If you want more privacy, choose a frosted or decorative film. You can even order a custom design featuring your company logo or branding. Learn about frosted and decorative window film. Does Your Business Need Enhanced Security? Locks on your doors won’t do any good if someone decides to break a window. Security window film makes it more difficult for thieves to smash the glass and gain entry. The film also helps in the case of natural disasters. This strong product keeps broken glass from flying. If glass breaks, the pieces are held together by the film. If your property has a problem with graffiti, we have a product that can help. We can adhere Graffiti Gard to nearly any smooth surface, indoors or outdoors. If vandals strike, the film is easily replaced. Learn more about safety film and graffiti protection. We install many types of commercial window film. We’ll suggest a product that best suits your needs. Contact us for an estimate and consultation.